Burghley aims to be as accessible as possible to all within the confines of a Grade One listed building. Disabled parking is available close to the house entrance and there are disabled toilet facilities. 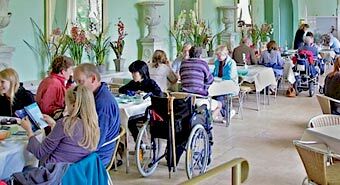 All of the state rooms and the Orangery restaurant are on the first floor and are accessible via two chair lifts. These lifts do not take a wheelchair and you will need to transfer onto and off the lift. We also have movable ramps for use in other areas of the property. Burghley is an historic property and there are occasional steps. If you are part of a group of disabled visitors, or have other needs please do call in advance so we can make arrangements for you. Registered guide dogs are allowed in the house, as are manual wheelchairs. 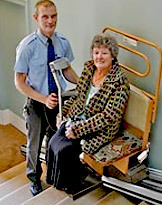 Unfortunately due to the nature of the access it is not possible to take mechanised wheelchairs into the house. The garden of surprises is completely accessible as is the brewhouse visitor entrance and interpretation centre. The sculpture garden has mown grass and bark chipping paths which are accessible in good weather. The park has tarmac paths and roads, whilst the road to the gardens is gravel, although a strip to the side is swept to make pushing wheelchairs and pushchairs easier.